Before I worked for the The Group Real Estate, here in Idaho Falls, Idaho, I worked for a local company called Kyani. They are a multi level marketing company that somewhat competes with Melaleuca. Their notions of how they do business differs drastically, so there isn’t much to compare. Now, I don’t want this to be a pessimistic blog, by any means, but my time at Kyani wasn’t the best. I will leave it at that. However, one of the great memories I have, was being able to see Rome. I was a part of a team that helped put together events, foreign and domestic. So, for the European side of our company, we opted for Rome to be the hub of that years European Event. Now, people would hear that I was going to these places for work, and I would always hear the same thing, “Oh, so difficult, you are going to Rome.” I say this, because there were times that we got to experience the food, or the sites, yes, but more than 18 hours a day were spent in hotels and event centers, unless we decided to pay to extend the trip. Going to Rome, I opted to do so. We stayed for a few days after to experience Rome the best we could. The place that most people talk about, is the Colosseum. A place that is rich with some crazy amounts of dark history. 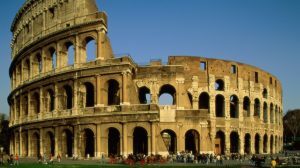 As the Caesar of Rome at the time of its conception wanted a place for entertainment, built on the back of slaves, Rome created the Colosseum. Now, its history is far superior to going there, in my opinion. It has a very gnarly past, including the slaughter of something, like, 5000 people on the day that it had it’s “grand opening.” The idea that they could put ships in there, filling it with water, to recreate ship battles, is nothing short of extraordinary. The brutality of it all, is quite disgusting, though. It was neat to go inside, and read up on certain parts of it’s history, don’t get me wrong. But seeing it from the outside, was just as worth it, as you can google the events and things that happened there. Or make sure to watch Gladiator, a masterful piece of film making, and it also gives you just as much information as I received from plaques there. The idea of being there where millions were killed, and died, was the most harrowing part of being there. Walking around Rome at night time was the best part. Seeing so much of this beautiful ancient city at night time was one of the highlights of the trip. The pizza there was just as good as you would think. A guy with stomach issues, I can’t do pastas here in America, but I ate pastas and pizzas every single day while I was there, and I had no problems. The way it was made, the servings sizes and styles, being so much cleaner than the way we do things here in America. The pizzas were great. Think of any kinds of toppings that you can think of, and that is what they had to offer there. My favorite was the pear and walnut pizza. The best type of pizza I had there. 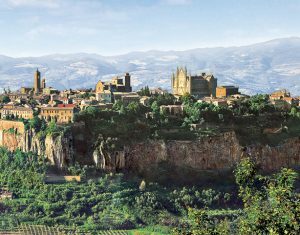 One of the highlights of the trip, that actually happened during the work times, was I was in charge of running a road rally with the cars that the distributors can earn, in a place called Orvieto. An ancient city that sits up on a plateau, is surrounded by a wall, and feels as though you are in the towns from Beauty and the Beast. The hotel we stayed in was over 300 years old. The churches still rang with the songs of the monks that were there in the church at the time of us being there. The roads were made of cobble stones. It was a very magical place. There is no other way to describe it. The number one highlight of the trip was going to the Vatican though. To see the biggest Catholic church, venue, area, statues, etc. in the world was absolutely incredible. Going inside the Vatican and seeing the vaulted walls and ceilings, I felt as though I was in an Assassins Creed game. It was absolutely beautiful, the workings on the statues were other worldly, and to hear actual masses going on while we were walking around was quite the treat. 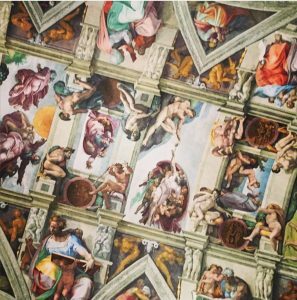 Then, we went to the Sistine Chapel. To see the paintings that Michelangelo did, first hand, was absolutely beautiful. The spirit felt there in the room, was incredible. There was no photography, but (as everyone did), I was able to get the picture below on my cell phone. I would love to talk with you about my trip to Osaka, Japan later. And the reason being, is it was a better place and experience, than Rome. Only in the way that if I were to take my wife out of the country, I would choose Japan over Italy. But, with that being said, if you get the chance to go to Rome, make sure that you see the Vatican. If you have time, take tour bus rides around the city, get yourself some gelato (to die for!) and make sure you try the pear and walnut pizza.